Here is an excerpt from the fabulous, surreal Ladislaw Starewicz stop-motion animation short “The Mascot” from 1933… there is a lot more to this cartoon that is not shown, but unfortunately, this is the longest clip of it I’ve seen on the internet. Anyone out there know of a full version somewhere? UPDATE: I have posted the full version here. In any case, you can see the full version along with a lot of other amazing Starewicz cartoons on the The Cameraman’s Revenge and Other Fantastic Tales DVD. Starewicz was one of the earliest stop-motion animators. You can read more about Starewicz here. There are some short Starewicz videos, along with some other amazing eastern European stop motion animation examples that I ran across here. The Gumby cartoon that must have inspired David Lynch’s Eraserhead. This is a fun, early Ray Harryhausen cartoon… it is clunky compared to much of his later work (Harryhausen is probably most famous for the stop motion animation in The Clash of the Titans and the Sinbad movies), but very charming nonetheless. You can already see what a talented animator he is… he puts a lot of subtle detail into the characters’ movements. He has some pretty interesting verses I hadn’t heard in there for Old Mother Hubbard. Meet the Peanut Vendor. It is credited to “Len Lye” on youtube (although in the comments, someone claims it is actually by Dave Fleischer). Judging from the other Len Lye films on youtube, it seems unlikely it is by him, as none of the others feature any character animation that I saw… and the character animation in this gem is quite good, and would appear to be by someone with experience. Anyone know the answer to this? Update: It is directed by Dave Fleischer all right. No wonder it’s so great. Hi – I can assure you that this film is by Len Lye – see my comment on YouTube. The monkey happens to be owned by the New Zealand Film Archive, actually. Lye made one other stop-motion animated film – The Birth of the Robot. Anyway, glad you liked the film. 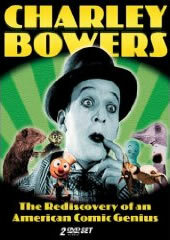 The protagonist of this film is a marionette monkey built by the film-maker himself. Lye presented this film as a prototype in the hope of finding partners for a series of puppet films, but without success.